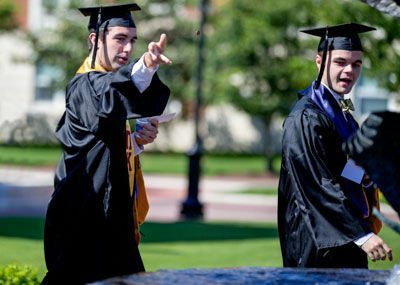 Convocation welcomes the incoming freshman class in celebration each new school year, and marks each students’ commitment to CNU’s community of honor. Faculty, alumni and others are on hand as each student signs the honor code. Each student is given a penny for luck and to symbolize a common purpose and dedication to live an honorable life. At commencement, the graduates throw their pennies in the Geese Fountain during the procession to the Great Lawn. those who learn and lead here. 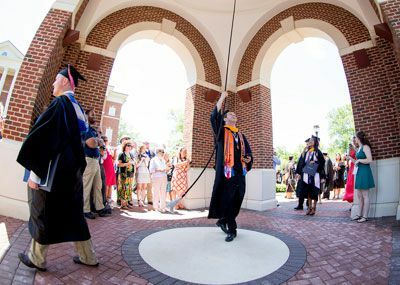 The Clock Tower bell celebrates special events, like athletic victories and commencement. Each fall incoming freshmen ring the bell after the Community of Scholars Convocation, and each spring the graduates ring it in celebration of their achievement. The tower features the bell from the SS United States, a gift from the late Dr. Sarah Forbes, CNU friend and benefactor. Built in Newport News in the early 1950s, the ship is the largest passenger ocean liner built entirely in the U.S.
A carillon chimes the hour and plays the “Fight Song” at noon and the alma mater at 5 p.m.
Each fall, we welcome students’ families to share in the energy and enthusiasm of what it means to be a Captain. It’s an exciting time to celebrate the dedicated family members who contribute so much to student success, and includes music, sports and fun for the whole family. 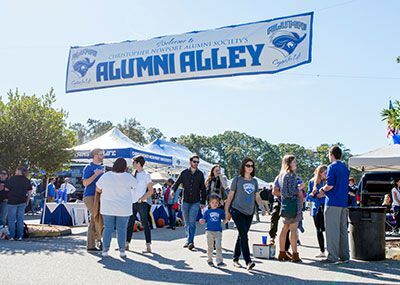 At Homecoming we invite all Christopher Newport alumni to campus to celebrate their student days and reconnect with classmates and the University. 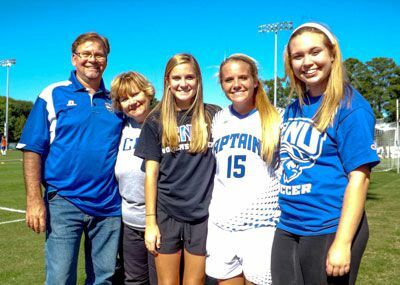 From tailgating and football to the famous golf cart parade, Homecoming is the perfect opportunity to honor the past and embrace the future of Christopher Newport. Each spring, representatives from each academic department gather to welcome sophomores as they declare their majors, meet new colleagues and faculty and learn about the challenges and opportunities ahead of them in their new field of study. 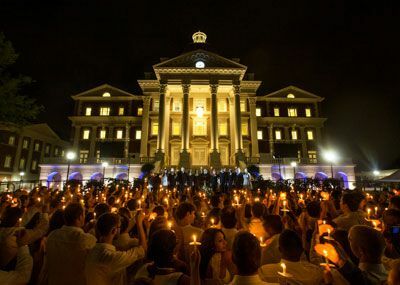 Candlelight is a solemn but celebratory occasion held at sundown the night before commencement to commemorate the newest graduates’ transition to Christopher Newport alumni. Each student lights a candle from the flame of another to symbolize the knowledge, experience and memories passed between peers and friends. At the conclusion of the ceremony the graduates sing the alma mater before celebrating their newfound alumni status at a reception at the president’s house. The Office of Alumni Relations, in collaboration with Jostens and many alumni and students, designed an official Christopher Newport ring. Juniors who order one can take part in an official ceremony on the Great Lawn with President Paul Trible.